Visiting Ubud? Remember Ketut Liyer! Ubud and Ketut Liyer is the main attraction of foreign tourists since a movie titled Eat Pray Love tells the life story of women who get love in Bali. Ketut Liyer is an actor who played a major role in the love story of Elizabeth Gilbert, who met a handsome man in Bali. And now a lover. Ketut Liyer stay in Ubud. He is an old man who can predict a person's life just by looking at the lines on the palm of the hand. He became famous since Eat Pray Love shows the character of a fortune teller who can predict a woman's life story. Ketut Liyer is now sought after by many tourists who visit to Bali. Tourists who meet with Ketut mostly just want to know the figure of a fortune teller. Basically he was a physician with traditional treatment techniques. Ubud is an exotic city in Gianyar regency. Residents of Ubud is very friendly with the social life and the arts. Nature in Ubud is also very beautiful, with exotic terraced rice fields. During a visit to of Ubud, tourists would think to meet with Ketut Liyer. Although not for predictable, at least they know the house where Elisabeth Gilbert predicted by an old man. 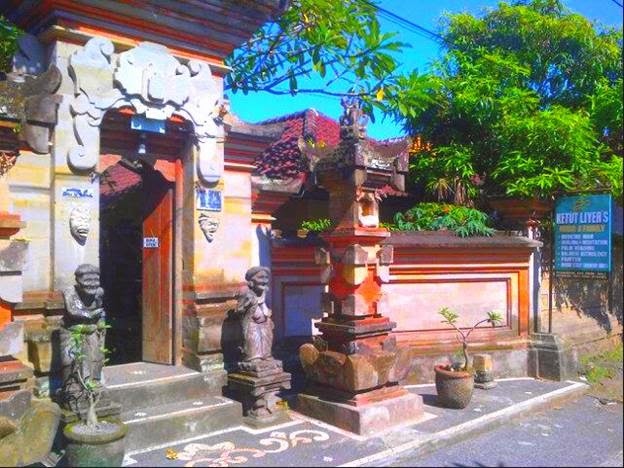 Ketut Liyer house address is in Jalan Raya Pengosekan (Mas - Ubud), Gianyar, Bali, Indonesia. It is easy in the search, because it is on the tourist track towards the center of Ubud. If you want to visit Ketut Liyer home to forecast, you should come in early, because Ketut limit the number of people to forecast each day. But if you just want to know Ketut home, without wanting to forecast, you can visit at any time while he was at home. Ubud has many interesting and diverse attractions. Ketut Liyer visited the house, is a tourist attraction in Ubud is very popular today. If you want to visit the city center of Ubud, Ubud Art Market, Puri Lukisan Museum, Monkey Forest, before visiting these places, you should stop by at Ketut houses. His house is very comfortable with the design and architecture are typical of the Balinese. Usually on the road through, from the city of Denpasar or Kuta to go downtown Ubud is Pengosekan Jalan Raya to the north. To go home Ketut, from Jalan Raya Pengosekan, must go through a small alley. If you are from the south, right at T-junction on Bhuwana Ubud Hotel & Spa, you turn right. Tip of the road turn right. 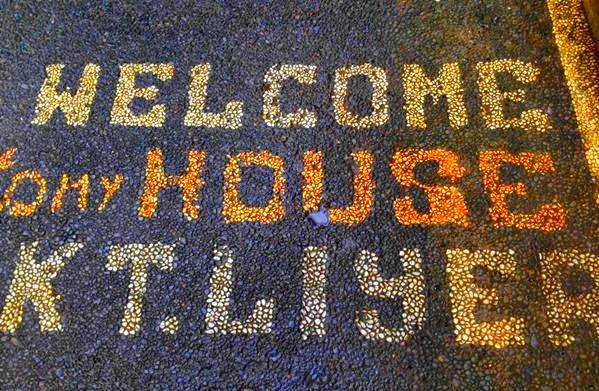 You can ask the people at the venue, about the houses Ketut Liyer. 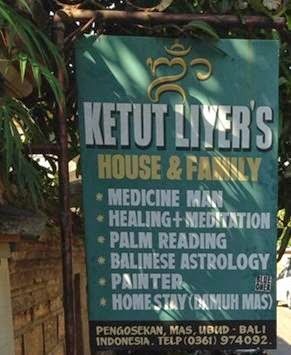 The characteristics of Ketut Liyer house's, in front of the house there is a signboard with the inscription, "KETUT LIYER'S HOUSE & FAMILY, MEDICINE MAN, HEALING + MEDITAION, PALM READING, ASTROLOGY BALINESE, PAINTER, HOME STAY (DAMUH MAS)". The entrance to the designs and ornaments of the Balinese. At the entrance there are two statues that resemble old man. On the left and right doors at either of two wooden masks. If Ketut Liyer are at home, then the door will open.